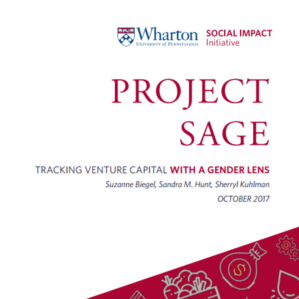 Project Sage is a global scan of private equity, venture capital and private debt funds with a gender lens, published today as a collaboration between the Wharton Social Impact Initiative (WSII) at the Wharton School, University of Pennsylvania, and Suzanne Biegel, Catalyst at Large. Download the full Project Sage report here. Over the last three years, as a private investor as well as a field-builder, I have spoken to over 150 private equity, venture capital and debt funds about their approaches to gender lens investing (GLI), in addition to intermediaries who are helping new funds to come into being. The funds listed in Project Sage have raised and are deploying almost $1.3bn in capital with a gender lens to date. Combined, the 58 funds are targeting a raise of over $1.8bn. Most of the funds we tracked (62%) are first-time funds, and most of the funds we found are overwhelmingly based in or deploying capital in the U.S. When gender criteria are mentioned, use of language varies greatly. We found variations in gender lens criteria and in the language used by different fund managers to describe those criteria. Understanding how and why people choose these lenses and language could provide useful insights for other funds deciding how to address their gender lenses in their investment thesis. That’s why we created a taxonomy that distinguishes between funds that have a quantified Gender Mandate, a Gender Mandate, and a Gender Consideration. See our report for more information on this. More funds were launched in 2017 than any other year we tracked. Nearly half the funds–21 of 58–launched this year. This is an indication that the field is gathering momentum. There are at least another dozen funds – some of them quite sizeable – which weren’t included in our scan because they are not ready to be public, or we found out about them too late. The gender of GLI fund management teams and investment committees is a complete departure from industry averages in venture capital. The Crunchbase Women in Venture report puts the number of women venture partners and women on investment committees at just 7%. However, 59% of Project Sage funds had all women partners. Many funds in the market are deploying capital towards women but not talking about it (and so they are not part of our current scan). Our scan was focused on funds that explicitly asserted a gender lens approach. So, we didn’t include funds that invested in women but didn’t include that in their investment thesis – though many of these have come up in my conversations. For example, one fund team is investing in solutions to get toxic substances out of products, which has tremendous potential implications on women’s health – even though it’s not an explicit part of their investment thesis. This suggests that there is more capital flowing toward women than our fund indicates. In separate blog posts, I’ll be talking about some of the reasons why fund managers choose to not talk about their gender lens(es). We hope actors in the investment ecosystem will find Project Sage of value, and that it will foster new collaborations, insights, and action. Thank you to all of the fund managers for this collaboration. Please let us know your thoughts, particularly if there’s a fund we didn’t – but should – include in the future. You can now read a summary of Project Sage findings and view the data online, detailing fund size (where provided), geographical, sectoral and thematic focus, gender lens criteria, percentage of women fund partners or limited partners, and more.